The Blog of Thog: Safety signs - too many or not enough? You know those really stupid safety signs? Of course grapes on the floor can be tripped on. 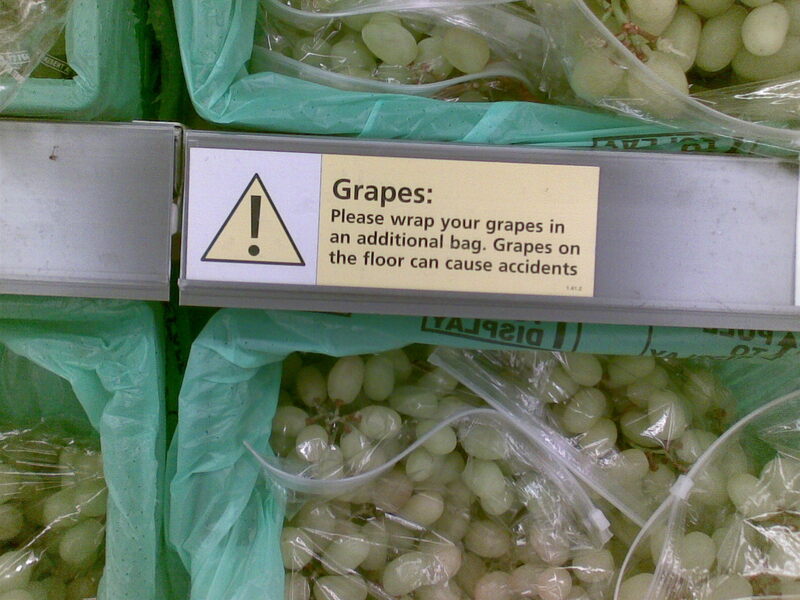 You're in the fruit and veg section of a supermarket, check where you're walking! I think I need more of them. I just took a big sip of a hot chocolate and spat it down my t-shirt because it was too hot. The worst thing is not long ago I completed a certificate in health and safety! Today however, I found a new, even better warning. On a tube of Asda Antiseptic First Aid cream - you put it on small cuts and spots - the warnings on the pack include "Avoid contact with eyes, middle ear, brain"... whoa, hold on a second. Brain?!? Who damages their skull and decides to treat it with some antiseptic cream?!? The warning further explains that you should avoid contact with the brain "if using [the cream] in a surgical procedure". Now I like Asda, I often shop there - it's near to my house, things are generally inexpensive, I find it a good place to do a lot of my shopping. But I do think that I'd be worried if, when in hospital for an operation, the consultant came to me and said "Right then Mr Raven, the procedure shall go as follows - we'll give you a general anaesthetic to put you out, then we'll take a saw to cut away your skull, we'll then lightly cover your brain with Asda Antiseptic First Aid cream, replace the skull and sow you up before you wake up again. Any questions?" Prohibition indication usually indicates a indication, which does not allow a unusual kind of actions, which is likely to cause harm, or is risky.